The first time I saw the painting, part of a solo show at Henry Street Settlement's Abrons Arts Center on the Lower East Side, I was wowed. It was gorgeous and looking at it made me feel very, very happy. And then, over the next few weeks, every time I saw it, I liked it more and more, if that were possible. I asked for the price list. Expensive, but hey, I'm worth it, right? Plus the thought of being able to see that gorgeous painting every day was irresistible. So after DH saw it and liked it as much as I did, we made the purchase. 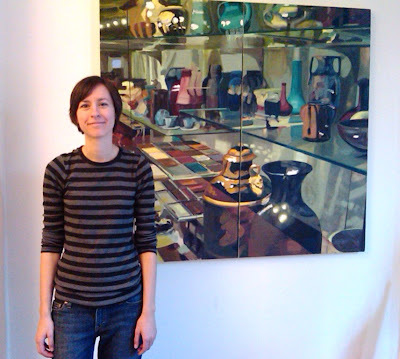 Beth with the painting, called Visible Storage: Green Vases. * This photograph doesn't capture its beauty. I met the painter, Beth Livensperger, when she was taking down the show. Like me, Beth is a native of Ohio and perhaps it was her Midwestern kindness that prompted her to offer to hang the painting in my house. I was thrilled -- those sorts of tasks are way beyond my capability. So on Saturday, power tools in hand, Beth arrived. My own power tools (a Kitchen Aid mixer and oven) were also in use as I baked a cake especially for Beth. She had told me that for her first birthday, she got a zucchini cake because her mother wanted to be healthy but when her younger sister's first birthday came around, she got chocolate cake. It took three small zucchini to get two cups of grated vegetable. 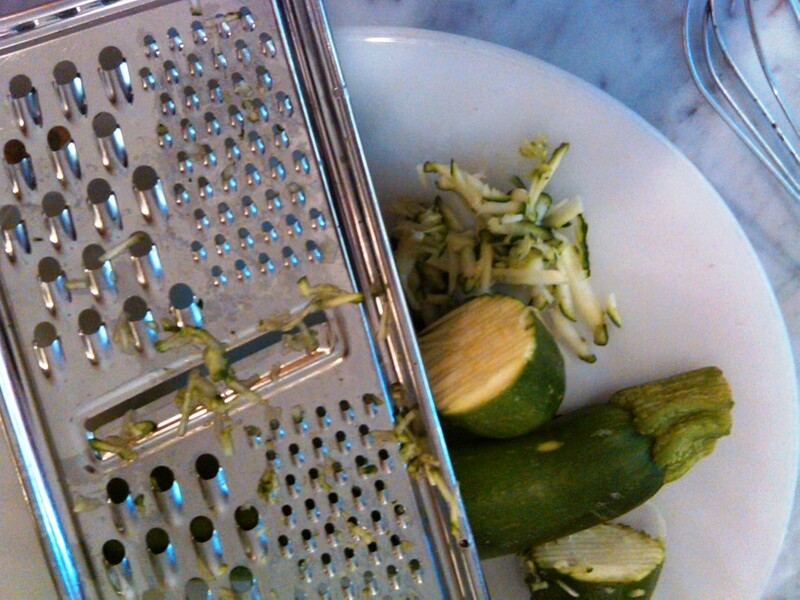 I used the small holes on the grater. 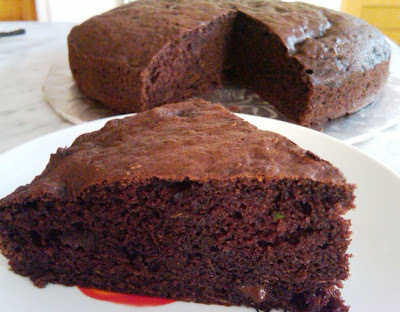 I did the only rational thing: I baked a chocolate zucchini cake. Somewhere in my vast and messy collection of old recipes, I might have one for some version of this cake. 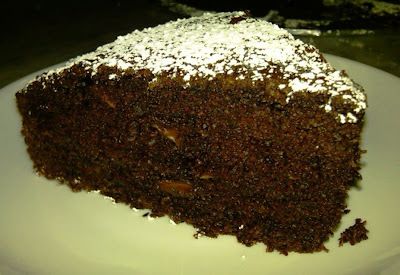 But, I didn't have time to search among the recipe cards, so I found this recipe on a Parisian blog I've been following for years called none other than Chocolate and Zucchini. The recipe is below. 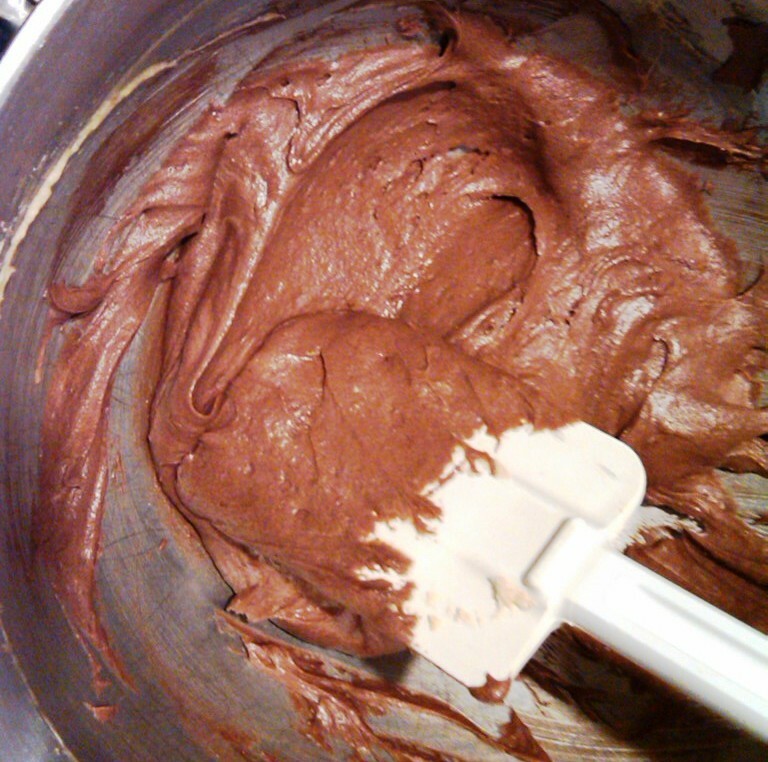 The batter before the zucchini is added. A bit of confectioner's sugar sprinkled on top (see first picture in post) is the perfect "frosting " for this cake. This cake is quite moist and it takes just like a chocolate cake. You can't taste the zucchini at all -- it adds moistness and, presumably, health. I used a 9 inch springform pan which was perfect. The grated zucchini seemed to clump, but using glove covered fingers, I manually tired to separate it and added it in small chunks to the chocolate batter. Turned out that in the final cake, it was well distributed, so don't worry if it looks clumpy.